Food that is prepared at a food establishment and transported to another location must be sealed in plastic. For products that are removed from their original packaging, bulk items such as flour, beans, and rice, should be stored in containers or storage bins that are durable, leak proof, and have the ability to be sealed or covered. Cross contact is when allergens are transferred to another food item accidentally. Use designated utensils and equipment. Make sure your food is stored and served properly, no damages or spills. 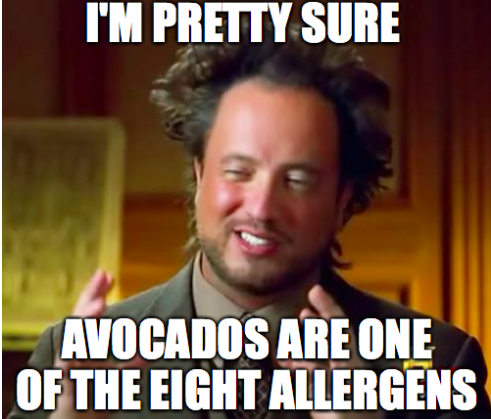 Serve the Allergen Friendly® meal separately. Large quantities of food can be cooled at room temperature. Identify allergies, let your server know! Some establishments ask customers if anyone in their party has any food allergens. In some health jurisdictions (like Rhode Island) it’s the customer’s obligation to inform the establishment if there is a food issue. I'm not touching you! Good. Keep your hands to yourself when preparing or handling food.